Why a Chart Control ? â being able to record, visualize and export precise Performance Data can be very useful. Research, Presentation, Optimization and Curiousity. 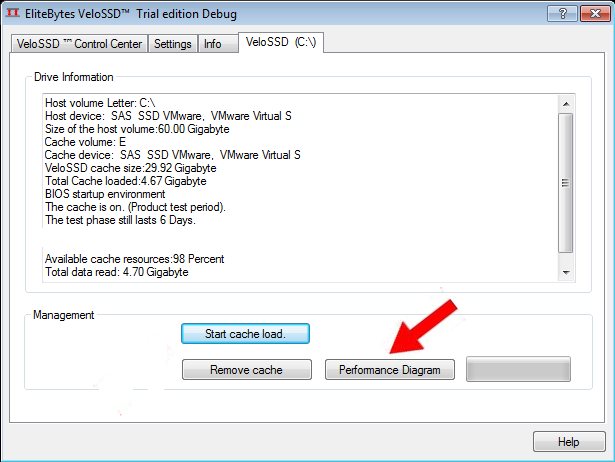 This Data has been collected directly from the VeloSSD Driver and shows the traffic on the cached Volume. Total Read Packets per Second (Green ). 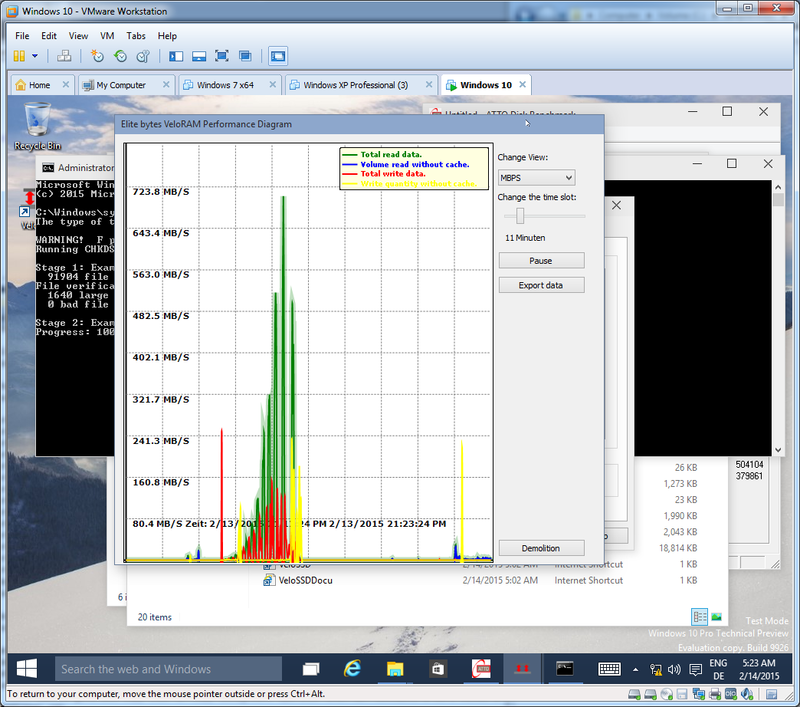 Total Write Packets per Second ( Red ). Cache missed Read Packets ( Blue ). Cache missed Write Packets ( Yellow ). Total amount of Read Data per Second (Green ). Total amount of Read Data per Second (Red ). Cache missed amount of Read Data per Second (Blue ). Cache missed amount of Read Data per Second (Yellow ). Logically In both View Modes the Green Chart is allway higher or equal to the Blue chart. But the Red Chart is sometimes lower then the Yellow Chart. Why that ? â the Title âCache missed Write Packetsâ is a bit misleading since all writes are cached. But it shows the Write Back Traffic. Clicking this Buttons pauses the actualization of the Display. Clicking it again will continue the charting. The Data can be exported in a XML File Format. The maximum size is 60 minutes. If you need longer Recordings please contact oem@elitebytes.com. 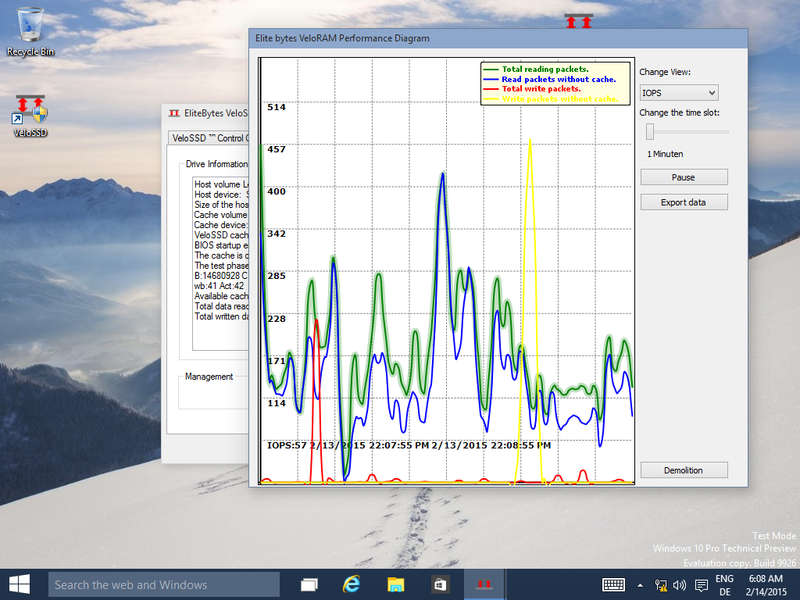 This picture shows the IOPS View Mode while the Operating System is idle. At the lower edge you can see the Time Axis Description. Ranging from 22:07:55 to 22:08:55 in a 1 minute Time Window. You can recognize cached IOÂ´s on the green Chart. This picture shows the IOPS View Mode. Again at the lower Edge there is a time Axis Description, now showing a time window of 11 Minutes. As this is a full screen Snapshot you can recognize a popular Benchmark Software in the taskbar. The Chart showing a typical Synthetic Benchmark run.